Just Listed! 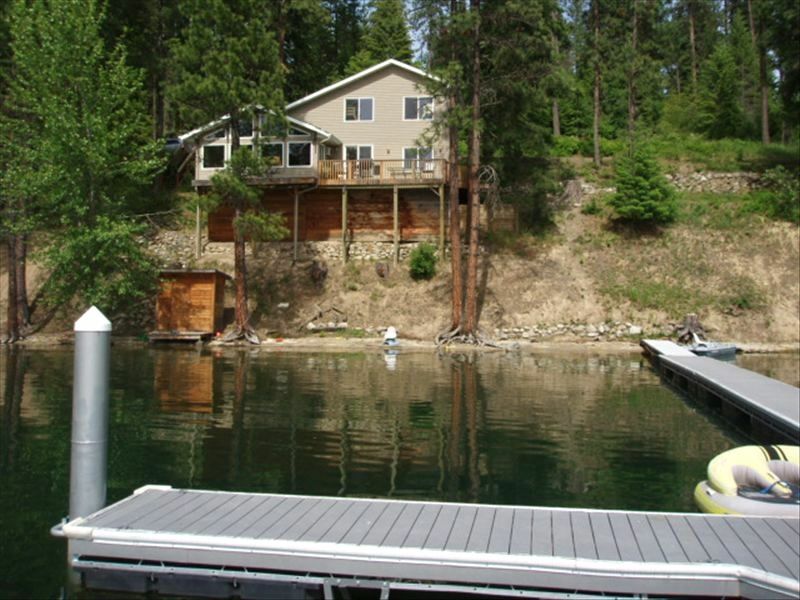 Hayden Lake Waterfront Home W/Boat Dock! This cabin sits in quiet Mokins Bay, a 25 minute drive from the town of Hayden. Beautiful views circle around you from every angle. Mokins bay is a no wake zone and remains extremely quite during all seasons of the year. Because of the tranquility of the location, fish can be seen almost daily swimming near the beach or dock. The location also has a private dock right off of your own private beach, which is wonderful for swimming, sun bathing, boating and fishing. Dock can be open and available for those travelers wishing to bring their boat or jet skis. Just a short boat ride to the end of the bay, and you will be at the best swimming location on the lake. Known to many as the Sandbar, you will find white sand beneath the crystal clear water. The Sandbar is wonderful for swimming or just relaxing on your boat. The hills behind the home are state owned and great for wilderness hikes. Wildlife, such as deer, elk, moose and turkey can often be seen here. There are also many trails close by for mountain biking. For those looking for a more relaxing vacation, just step out onto the back deck and watch the birds sore over the water and the fish swim beneath it. Inside the home you will find two bedrooms and a bunk room. The main bedroom is located on the main floor with a queen bed. Wake up in this room to over look the lake. Upstairs there is a bed room and bunk room. Both rooms contain bunk beds with twin on top and full bed on bottom. In the bunk room you will also find a TV with DVD/VCR player. On the main floor, you will find a living room with flat screen TV and DVD player, a kitchen (with dish washer) and an eating area. On the back deck is a table, chairs and propane BBQ. A great place to watch the sun set over dinner. Everything you need from linens to towels and cooking utensils can be found here. Clothing, food and a camera should be all you will need to bring. Loved it!! Would stay again anytime. Parking is a bit limited, but otherwise fantastic!! My husband and I, along with our three grown children chose Hayden Lake as a convenient spot to meet for Labor Day weekend. Bill was upfront immediately and told me that the lake was the lowest it's been in years, but we did not have a boat, anyway. I appreciated his candor. This house indeed had everything that we needed. It is clean and comfortable. The view is fantastic! Be prepared for a curvy road from Coeur d'Alene, and make sure to bring all that you will need as you won't be able to run to the grocery store in a minute. But the solitude is wonderful if you want to kick back and relax. Of the many VRBO properties that we have rented over the years, this one was one of the best. The house is beautifully situated at one of the easternmost reaches of Hayden Lake, isolated from most of the boat noise of the rest of the lake. Between the deck, the private beach, and the kayaks, you'll have next to no reason to stay inside. We stayed for a few days midsummer—four adults and three frisky children—but I imagine it would be utterly beautiful early to mid autumn, as well. This cabin was amazing! There is plenty of room for 7 people. The house was loaded with things to do, including lots of movies, a fire pit, paddle boats, kayaks, and fishing. On top of that, the large windows gave a breathtaking view of the lake! The only downside was that we weren't able to get on the Internet on our phones, but it was well worth it! Definitely would love to come back! We loved the cabin on Hayden lake. It was clean and comfortable with a great view. The only drawback was we could not swim at the beach below the cabin and about 3pm the west sun was blinding. Due to the close proximity to our daughter's house in Hayden the location was perfect. What an awesome cabin! The cabin was equipped with everything we needed. The cabin is perfectly located on a quiet bay on Hayden Lake. The deck was so enjoyable in the evenings. Our teenagers loved the movie selections and the water sports. It was very quiet and clean. Such a great place to spend a few summer days/nights away from it all. We would highly recommend staying at this cabin. The owner was very helpful.